United States Awning & Custom Architectural Products has been operating since 1962. The family company caters to homeowners and businesses throughout the Southwest Florida region. They carry a range of home products, including custom architectural products, retractable awnings, rollershades, blinds and curtains, railing and fencing, and methods of storm protection. 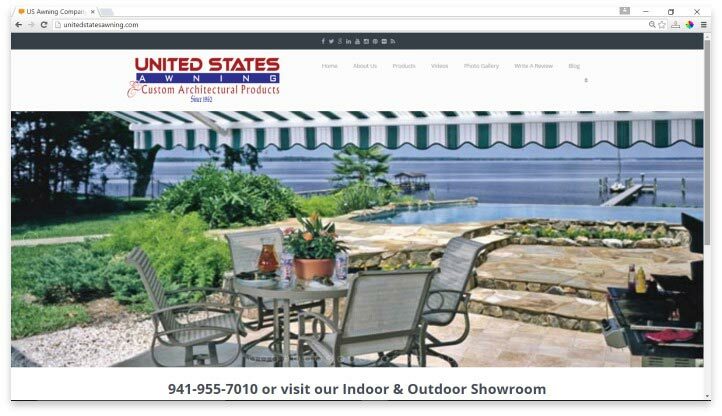 Everything is constructed at the United States Awning & Custom Architectural Products warehouse in Sarasota, Florida. Fortunately, the United States Awning & Custom Architectural Products website doesn’t affect the quality of their products. Their website is dated, and doesn’t provide enough information to help consumers make an informed decision without calling the company or filling out a quote form. Honestly, this is only excusable because of the customizable nature of all the products, which are made in-house. It would be hard for them to provide model and pricing information that fits each situation. The website does have example pictures of past projects that allow shoppers to get a glimpse of the craftsmanship that goes into each order. Within the Sarasota factory is a high-tech metal fabrication workshop and a sewing facility that creates custom fabric products. This production model allows United States Awning & Custom Architectural Products to have a tight grasp on quality control. The company creates architectural products, like gazebos and lanais, customized covers for any size or shape required, custom retractable awnings, awnings for businesses, canopies, umbrellas, blinds, curtains and shades that emphasize energy efficiency, a range of metal fencing, railing and gate styles, and hurricane protection screens and barriers. The company also offers custom lettering that can be added to awnings for commercial uses. The small service sector of United States Awning & Custom Architectural Products is nice in some ways. Reviewers raved about customer service and installation experiences, along with the quality of product they got for the price. That being said, there is an extremely low number of reviews to be found. There are a few bad reviews, but those seem to be wrongly attributed to the company, as the reviewers mentioned the company’s competitors by name. One reviewer that seemed to be in the right place mentioned it took a while to get their product installed, but they also noted the quality of their order exceeded their expectations when it finally arrived. United States Awnings is a family owned and operated business known for quality craftsmanship of custom-made retractable awnings. United States Awning & Custom Architectural Products is a little behind the times when it comes to technology. Their web presence is minimal, which isn’t always a bad thing. The relatively small, in comparison to some other awning conglomerates, family owned and operated business is known for quality craftsmanship. Because their product is made in-house, they can correct any irregularities before it arrives at your home. That kind of quality and attention to detail comes at a price, and their custom products run more expensive than ready-made items you’d find at other stores. Have you had an experience with this company? Please share your United States Awning reviews below.